We've heard about it on the news, and in the papers but we hadn't paid much attention to it until yesterday. Caleb woke up complaining that he was dizzy when he stoop up and had some back pain. As the morning continued the back pain got worse and he had a fever and nausea. So I decided to take him to the doctor thinking he had a kidney infection or something like that. We were both so surprised when he said swine flu. There isn't really anything they can do for him, so we brought him home and put him to bed. I am amazed how hard it hits a healthy teenage boy. The doctor warned us that it would get worse before it gets better, and this morning he seems to be worse already. He also said we should all expect to get it, but the good news is once you have it you are immune to it. We can't decide if we want to get it and have it done with or avoid it! Caleb will be out of school for the week, which is not very good news for him. And according to our work policy, we are not allowed to go to work until he is no longer contagious, which is 24 hours after all his symptoms are gone. So I'm off work for the week, but Clark gets to work as long as he doesn't go to the office. The worse part is his 16th birthday is tomorrow! Guess this won't be the best birthday ever, but I think he will remember it. For his birthday we got him concert tickets. The concert is Sunday night, so we all have our fingers crossed that he will be well enough to go. 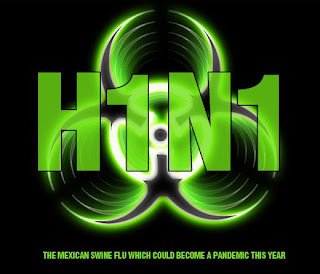 So we had a big debate here at work of people saying the H1N1 vacccine wasn't safe and they won't get it for their kids. After hearing how sick Caleb was I am taking my kids to the health department today to get it! I don't think I could deal with them being so sick. Or me for that matter. A week home from work always sounds good in theory..but isn't ever that great in reality. I am so sorry! We have had the flu here but not as bad as Caleb. Poor kid. Hope he gets feeling better and the rest of you stay healthy!